Sometime around 1916 artist William Wendt explored Laguna Beach for a site to build his new home when he rounded the curve on Old Coast Road near Moss Point. He apparently was struck by the isolation of the area, with a few scattered homes and trees, and captivated by the crimson setting sun and its reflection in the water. “The Old Coast Road” by Laguna Beach artist William Wendt recently sold for a record $1.6 million. The iconic painting that resulted, “The Old Coast Road,” was the big seller at Bonham’s sale of California & Western Paintings & Sculpture last month, bringing $1.6 million when it had been expected to fetch $600,000 and setting a new record for the artist. The painting is among the best-known works of its oeuvre because it served as the cover of Ruth Westphal’s “Plein Air Painters of California: The Southland,” published in 1982, the first illustrated compilation of plein air painters and what has become an influential guide for collectors of early California art. “It turned into a star,” said De McCall, whose De Rus Fine Arts gallery in Laguna Beach has specialized in early California artists since 1969. He knew of several collectors that he declined to identify interested in bidding for the prize at the well-attended April 28 auction in Los Angeles. The painting sold for triple the artist’s previous auction record, Scot Levitt, Bonham’s fine art director in Los Angeles, said in a statement. Bidders walked off with 86 percent of the nearly 200 lots offered. “It’s special in several ways,” explained Jean Stern, executive director of the Irvine Museum, which was offered the work through an agent, but declined to consider bidding because of the anticipated price. The Irvine Museum’s collection already includes several works by Wendt, whose paintings are also in at least eight other museum collections, including the Los Angeles County Museum of Art. Though Westphal’s book popularized and reproduced “The Old Coast Road,” the work is also special because of its scale and subject, the archetype scene of old Laguna, Stern said. “It’s from the springtime of art in Laguna Beach,” added Malcolm Warner, executive director of the Laguna Art Museum, who intends to ask the new owner to lend “The Old Coast Road” for the museum’s centennial exhibit in the summer of 2018. “That’s a prime painting we have in our sights,” Warner said. Because of the work’s prominence, he said, “there was a lot of buzz about who might buy it.” The museum wasn’t a bidder, he said, though Warner thinks the work “indisputably belongs in the Laguna Art Museum.” Like most museums, Warner must rely on gifts rather than purchases to expand the collection, which currently includes two Wendt landscapes. While auction houses do not typically disclose the name of the buyers, the owners of works up for sale are listed in Bonham’s catalog. And this one’s provenance comes with a twist. “The Old Coast Road” was one of four works sold by Bonham last month by the Jahraus family of Laguna Beach. They included Joseph Klietsch’s “Rue Bourbon-Penthievre, Vernon, France,” which sold for $20,000 and another Wendt, “Misty Morning, Santa Ana Canyon,” that fetched $143,000. The sellers are descendants of pioneer settler Elmer Jahraus and his son Joe, who founded Laguna Beach Lumber Company in 1913. A remnant of the company’s original building survives today as the Lumberyard restaurant on Forest Avenue. At the time, the lumberyard was the only local source of artists’ supplies, and painters occasionally bartered rather than paid. “There was a lot of that going on,” said Janet Blake, the Laguna Art Museum’s curator of historical art, who noted that Klietsch, Edgar Payne and Frank Cuprien as well as Wendt were known to trade work for wood to stretch their canvases. Wendt took advantage of the arrangement to trade a painting for lumber, according to the auction catalog. Correspondence shows that Wendt’s home and studio was at 2420 S. Coast Boulevard, where he lived with his wife, sculptor Julia Bracken Wendt, the catalog says. The highly regarded artist, who died in his adopted hometown in 1946, earned the title “dean” of Southern California artists, Stern wrote in a 2006 essay on Wendt. “The Old Coast Road” remained for four generations with the Jahraus family, which over time amassed a collection of works by Laguna’s early plein air artists. Family spokesman Jeff Jahraus declined to comment on the sale. 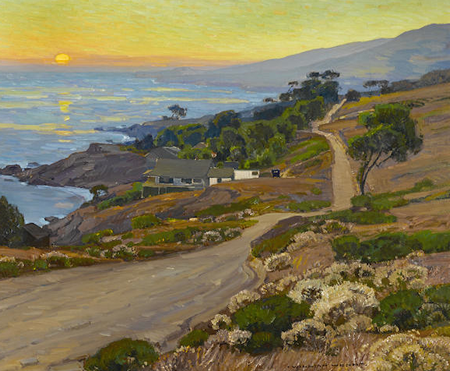 “The Old Coast Road” has been included in three previous Laguna Art Museum exhibitions, most recently “In Nature’s Temple, The Life and Art of William Wendt,” in 2008, and featured in two subsequent art books. Final prices reported by the auction house for each lot include a buyer’s premium of 25 percent of the first $100,000 and 20 percent from $100,000 to $2 million.